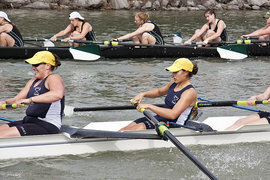 The women's crew team rows hard at a home race. Want to know what it feels like to win? Join one of Ithaca’s 26 Division III teams. Of the 22 IC teams that belong to the Empire 8 conference, 15 won regularseason or tournament titles (or both!). Here are some highlights from last year. Football The Bombers posted a record of 6-4, extending their streak of winning seasons to 40. But they did lose to SUNY Cortland, ending a three-year streak of taking home the Cortaca Jug. 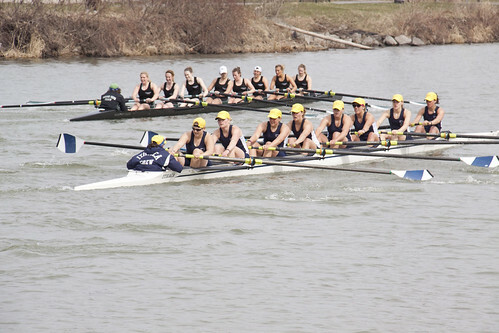 Women’s Crew A fourth-place finish at the NCAA championships marked the program’s ninth top-four finish. Ithaca is the only school to qualify for all 10 NCAA Division III championships. Wrestling With eight qualifiers in the NCAA championships, their biggest contingent in 19 years, the Ithaca College wrestling team placed fourth in the nation and earned an invitation to the 2012 National Duals in Chicago. Marty Nichols was named national Coach of the Year.